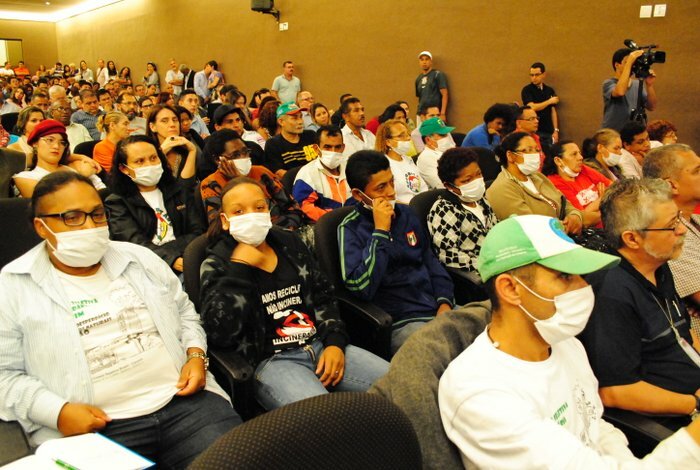 Waste pickers protest at a meeting about São Bernardo, São Paulo’s installation of an incinerator. Credit: MNCR. In a powerful symbol of protest to show the health impacts of incineration, a group of 30 waste pickers wore surgical masks during the debate. 150 waste pickers and residents of the former Alvarenga dump (the planned site of the incinerator) were barred from entering the church, with the explanation that there was no more room. In an act of protest, Maria Mônica da Silva, a waste picker and leader based in the neighboring city of Diadema, demanded the final words. She shamed the organizers for their lack of respect for the waste pickers who were left out of the debate.